I like giving our table an update each season, but I don't like spending a ton of money on any cheesy seasonal décor. Over the past few years I've started to collect some go-to entertaining pieces from thrift stores and antique stores and on sale at places like Marshalls and Home Goods and Target. 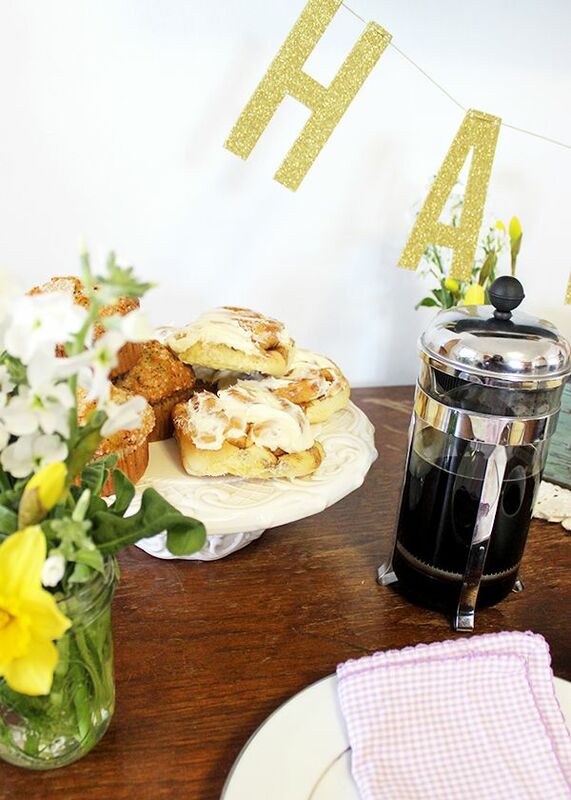 I knew I wanted to pull together a springy "garden party" table for an impromptu brunch with some coffee, tea, mimosas & pastries! The only thing I had to buy was some spring blooms (super inexpensive from Trader Joes) & some juice & pastries to snack on. I used a rustic chic herb gardening box to hold the mimosa essentials - like the OJ in an old fashioned glass milk jug. I got out my vintage cake plate & ombre glasses and arranged fresh flowers in mason jars leftover from canning season. The gingham napkins I've had for a few years, and I love the preppy, country chic feel they have. 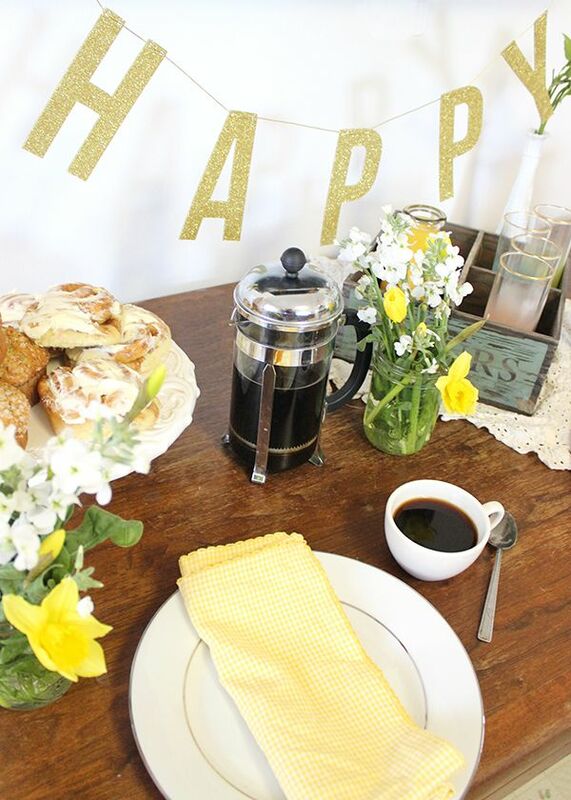 I love any occasion to celebrate- so the "Happy" gold sparkle banner I picked up for my office from Joann's and it makes me feel exactly that. I can't believe Easter is next week already! 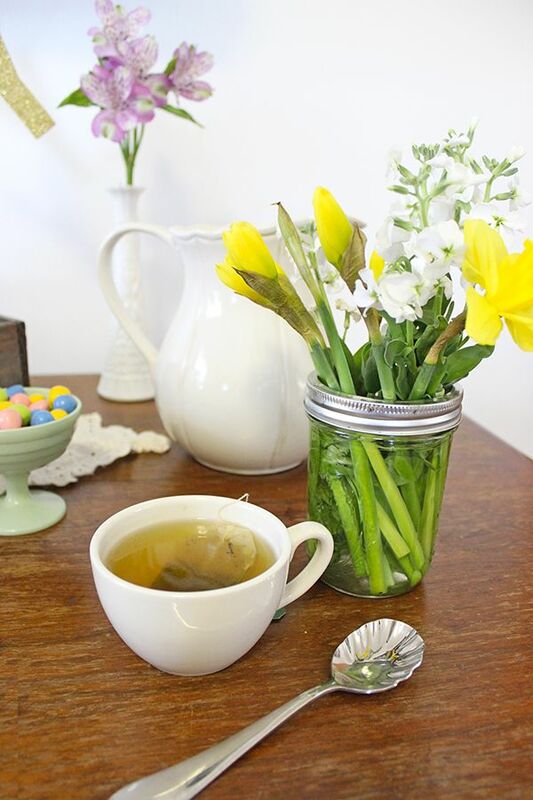 Here's some inspiration for creating a festive and simple spring tablescape. 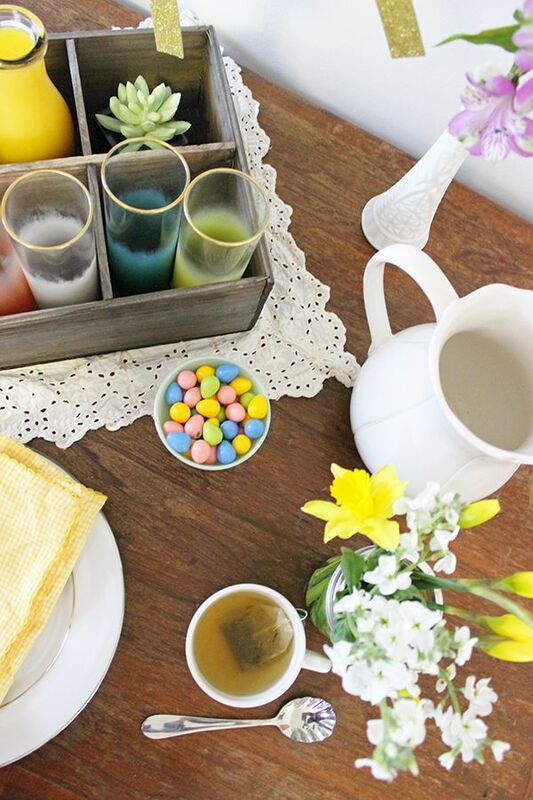 I love how our spring table turned out for brunch! I think it's a great example that you don't need to go out and buy all new pieces and décor when you're entertaining! You can save a ton of money, just by getting a little creative and using pieces you already have around the house. My bestie Jocelyn's vintage kitchen bridal brunch was a fun example of this! Build your collection of serving pieces! I love picking up vintage cake plates, statement making cocktail glasses & milk glass vases from thrift stores and antique stores. It's great if you can make everything from scratch, but don't feel guilty "cheating" and buying from the grocery store bakery! DIY floral arrangements can be a less expensive route than pre-made bouquets- use some filler florals like baby's breath and carnations to keep the cost of your arrangements down. Want to pick up a few seasonal décor items? Buy on the cheap when they get discounted post-holidays and save it so you can break out the next year. 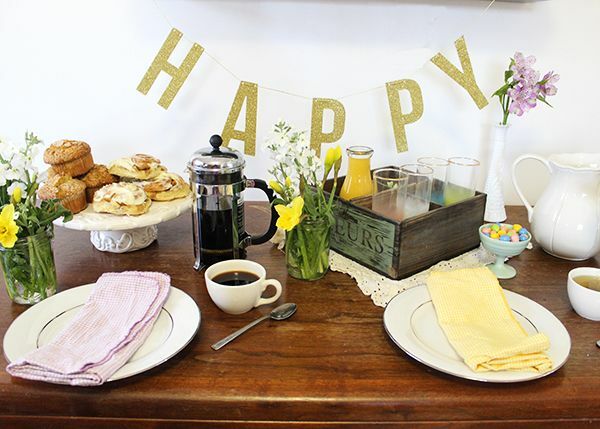 I think putting in a little extra effort to dress up your table for brunch makes for one happy table! I'm also a sucker for fresh blooms, which brighten up any brunch. What are your entertaining secrets? I love the eclectic vibe of your brunch table. I'm a sucker for flowers in mason jars. So pretty! Anddddd now I want breakfast! Yum!